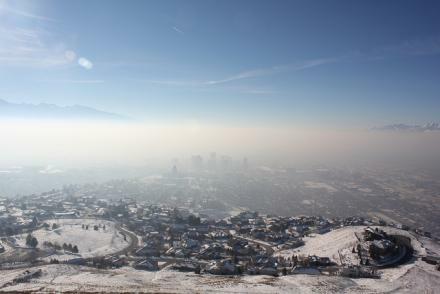 On Thursday, January 14, KUER hosted a panel discussion on air quality called Pollution Gets Personal at the Salt Lake City Public Library. The program was the first in a new series of solutions-based discussions called KUER Conversations. Pollution Gets Personal dealt primarily with pollution generated from businesses and homes, what air quality experts call: area sources. KUER environmental reporter Judy Fahys moderated the discussion with panelists and members of the audience. The panelists included: Utah Senator Scott Jenkins, Bryce Byrd from the Utah Division of Air Quality, Industry lobbyist Shelley Cordon Teusher and Matt Pacenza, Director of HEAL Utah. The event was recorded, and you can listen to the audio here. Disclosure: Shelly Cordon Teusher works for the law firm Parsons, Behle, Latimer and KUER does accept underwriting money from that firm, but that relationship with our development department did not play a role in Ms. Teusher’s decision to participate as a panelist at this event.